The Knitting Pirate » In Which the Pirate Has One Leg. « In Which the Pirate's Knitting Library Grows. In Which the Pirate Has One Leg. Yarrr, but not in the way that ye think, ye scurvy landlubber! Last night I finished the first leg of Blu and cast on right away for the second, just in case there's anything like Second Sock Syndrome for pants legs. The yarn does stain my fingers a little bit, but it washes right off. I'm not sure about my bamboo needles - they may be an interesting shade of blueish-green for a while. Once the pieces are washed for the first time, the extra dye should all go away. I don't want to have a blue niece, and I'm sure my brother and his wife would prefer if their baby remains baby-colored instead of blue! 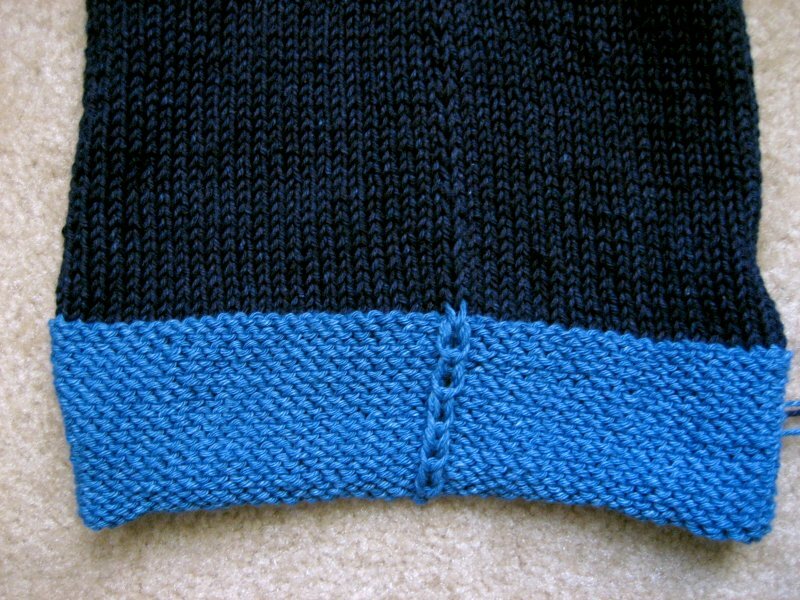 At one point in the pattern, you drop a stitch all the way down to the cuff, and then alternate picking up one and two ladders at a time. It ends up looking very much like the outseam on a grownup pair of jeans! 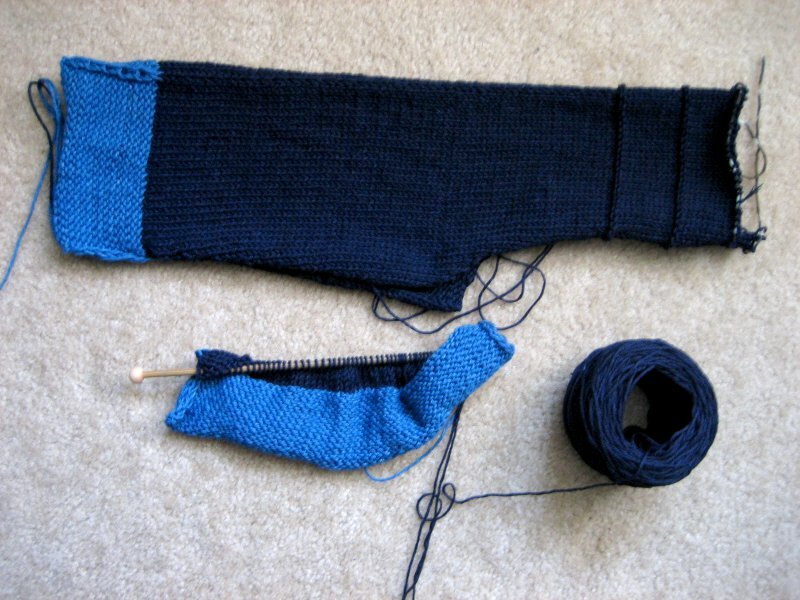 Another cool thing is that the yarn will fade, with time, just like grownup jeans. I'm really looking forward to seeing my niece fade these pants into light blue, just like I fade my jeans. These are the 12-18 month size, and I'm sure the crawling will do a number on the knees. This entry was posted on Sunday, April 8th, 2007 at 17:57 and is filed under babyclothes, blu. You can follow any responses to this entry through the RSS 2.0 feed. Both comments and pings are currently closed.